Ok, so I still can't figure out how to upload existing videos onto my blog, so I'm just going to give you some links to where you can find these online. In readings today, we watched two TED Talks. TED stands for Technology, Entertianment and Design. They are a small non-profit dedicated to "Ideas Worth Spreading". All types of people from writers to scientists to Mike Rowe of Dirty Jobs have given TED talks. Today we listened to Isabel Allende on passion and Ken Robinson on creativity in schools. These were both really excellent. Funny and uplifting they will make you feel great and put you in the mood to change the world! Another of my favorites is Elizabeth Gilbert on nurturing creativity and genuis. So, I'm not going to the Yuma Symposium this weekend, but a bunch of my friends are. We've all been making pins like mad! These are some of the pins my fellow ECU grads made for the Yuma pin swap. Starting at the top left and going clockwise, are Marissa Saneholtz, Abigail Heuss, Me , Laura Wood, Kat Cole and Autumn Brown. If you want one of my pins, you'll have to hunt me down in Houston! "You change one piece of ground to gold." So, as I've said before, I'm taking a Book Arts class, which is wonderful, frustrating, exciting and time consuming all at the same time, though I've given you very little proof thus far. Well, here you go. Our current project is pop ups, or paper engineering. These are just my practice pieces. I spent most of this afternoon working on the maquette of my actual book, which is due on Monday!!! I have my idea, and most of the structure worked out, but I'm still a little fuzzy on my imagery and on what media I'm going to use to execute my imagery. Although, I do have a hankering to do something in gouache. More pics to come! I had one of my greeting cards included in this really beautiful etsy treasury! You should go check it out! It was put together by SAKatelier, who has a lovely jewelry shop! So, I got my Artist to Artist Element Swap stuff back about a month ago from super talented Jillian Moore. She turned my reject enameled electroforms from my first semester of grad school into these juicy, weird, fantastic little brooches and a pendant! The brooch in the top right of the photo above is all Jillian though. Love them! Whenever I wear any of them I get bunches of questions and comments. Everyone keeps asking me if the pendant opens. It does not. It never did. But it does have metallic purple dots on the other side! I didn't photograph the stuff I sent to my partner. I'm kinda embarrassed about how long it took me. In the end, I only had one small piece that was inspired by the objects she sent me. I also sent her a pair of earrings, that reminded me a little bit of her work, and I sent her a rock brooch. I really enjoyed taking part in this swap, I just felt really bad that I didn't devote the time and attention to it that I should have. So, I finally set up an Etsy site for my jewelry. I've been dragging my feet on this for one reason or another, but I'm trying to figure out how I'm going to pay for my Italy trip this summer, plus my trip to Houston for SNAG. Also, I've been in grad school for a long time, and will probably still be in grad school for another year. I'm not expecting to make a million, but any little bit helps. So far I'm working on posting left overs from our sales here at ECU. It's not super representative of my work, but I do enjoy making it and the price points are relatively low. These are a few pieces from what I call my "Sweet and Simple" line. (Let's be serious, it's not really a line. I just like to buy gemstone beads.) These are really simple and pretty and, priced at $22, are really affordable. Now that the electroformer is fixed, I can try and really develop a more wearable, production version of my art pieces. I have some ideas, so look for those pieces soon. Also, I made a great pair of mica earrings that I love and have gotten some positive response to, so look for those soon also. "During this long process, the rock was warped, shattered, worn down, mixed, heated, and changed into new forms. It received just about every kind of treatment. New rock was made from the wreckage of older rock." Wow! What a week! Sorry I've been MIA for a few days but it was a busy, busy week. On Tuesday our BRAND NEW electroforming chemicals were delivered! So yesterday, the awesome people from campus Environmental Heath and Safety came over and helped me and a fellow grad empty the old chemicals out of the tank, and clean everything up. I then cleaned up the anodes and bus bars and after one little bus bar mix up we are back in business! I've seriously been waiting for this for over a year. I'm so excited! I swear it's one of the prettiest things I've ever seen! Also this week, we had the Valentine's sale, and I had 3 Japanese stab binding books due (These were really frustrating, but I really like the way mine turned out. I didn't get a chance to photograph them before I turned them in, so I'll post when I get them back.) Our first crit was this week and I absolutely love the pieces I did. (Again, no photos, sorry). Oh, and my birthday was in there somewhere I think. Busy busy! Next on my plate: pins for SNAG. If you're not snowbound and happen to be in the Greenville area tomorrow, or Thursday,stop by the art building for the annual ECU Metals Guild Valentine's Day Sale! The sale will be going on right outside the Gray Gallery, from noon to 7pm on both days. We'll have jewelry and Valentines. Other guilds in the art department will also have cool stuff for sale. 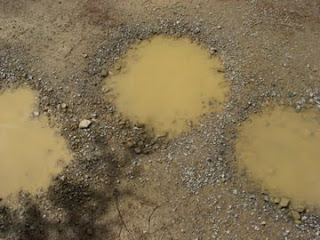 "Then I found some dirt to make an ointment that would honor my soul, and in mixing that I found poetry." Check out this fabric I found on Etsy! 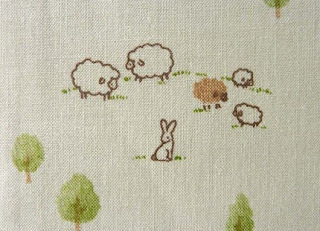 Rabbits AND sheep! Two of my favorite things! 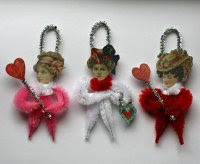 Sharon Massey from the Society for Contemporary Craft posted some work from "Charmed". You can purchase charms from a wide variety of talented artists here. So we're finally replacing our chemicals in our electroforming bath. They should hopefully be here soon, so I'm hoping I can get these in next week. So excited! you, but the qualities that block your growth." Sorry this is a bit late. I spent Friday and Saturday just playing around with my enamels. This was the first time in three weeks that I actually got to work on my own stuff! Crazy!